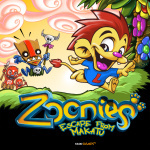 Kiloo Games just got in touch to announce the European release date for Zoonies - Escape from Makatu, a new puzzle-platformer for DSiWare. Leo the lion will touch down on 29th April for 500 Nintendo Points. After bailing out of his crashed plane deep in the jungle, Leo finds himself hunted down by the Tuba tribe and its evil leader Makatu. 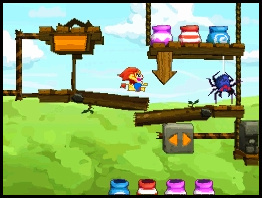 Players must use the stylus to move obstacles out of Leo's way so he can find his way to the exit in 20 levels across four worlds. We'll have the first trailer of Zoonies — Escape from Makatu online in the coming weeks.